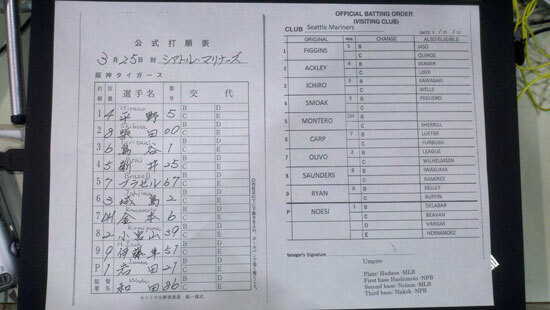 It’s finally gameday, as the Mariners kick off Japan Series week with an exhibition tilt against the Hanshin Tigers. Pregame activities were mostly the same as yesterday’s workout, with each team taking BP and infield practice in an empty Tokyo Dome. Of course, there were plenty of chances for old friends to catch up. 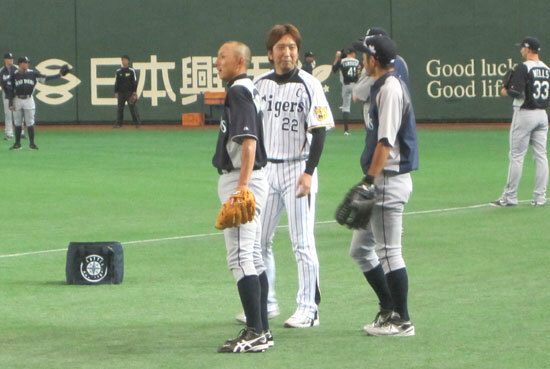 Mariners infielder Munenori Kawasaki embraced Tigers captain Kyuji Fujikawa. Former Major Leaguer Jason Standridge chatted with his old hitting coach, Chris Chambliss. Craig Brazell slipped a ball to a Mariners batboy for Ichiro to sign. Ichiro, well, Ichiro knows everyone. He’s like the mayor around here. Ichiro chatting with a Hanshin Tigers coach. Ichiro with teammate Muenori Kawasaki and Hanshin Tigers captain Kyuji Fujikawa. 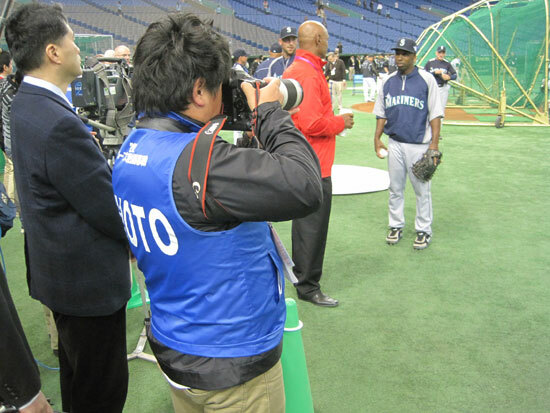 Fans began to trickle in as Mariners BP wound down, amassing in the first few rows behind home plate and calling to both Seattle and Hanshin players by name. The Tokyo Dome has protective netting between the field and the stands all the way from home plate to the outfield wall, but a few players tossed balls over to fans crowding behind the dugouts. Of course, the the Japanese media was out in force once again. After lineup announcements — during which Tigers fans politely cheered for every Mariners player — and national anthems for both Japan and the US, Minoru Iwata delivered his first pitch to Chone Figgins and we were underway. Check out Part 2 for more on Japanese baseball fans.